The John Deere model 70 brought diesel power to the row crop farmer. The tractor was not Deere’s biggest seller, but it was never expected to be, either. It was built to handle the particular needs of the large scale, row crop farmer. Its predecessor, the “G,” did not set any sales records either, but its brute strength and reliability had won over many farmers. The 70 took what the “G” had and improved upon it significantly. The diesel engine set a new record for fuel economy while remaining at the top of the industry in terms of power and reliability. This helped the 70 to do substantially better at the dealer than the “G” did. Deere improved further upon this design with the model 720, which not only sported more power and comfort, but bested even the 70 for fuel economy. 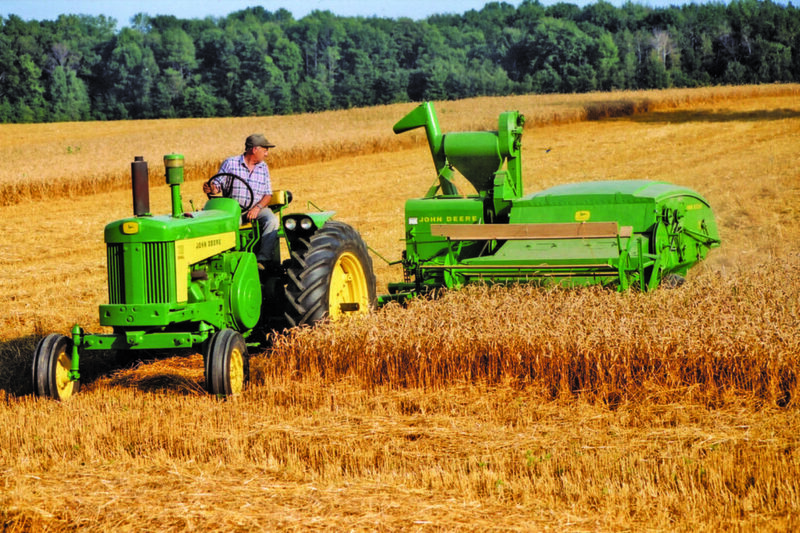 Deere’s engineers added a few mechanical improvements for the 1958 model year 720 tractors. As they did so, those in the know at Deere were aware that the end of the two cylinder tractor was near. They also knew, however, that the New Generation tractors were not going to be finished for the 1959 model year, as they had hoped. It would instead take two more years to fully develop the new tractors and have them ready for production. Talk around the industry was that IHC and Case were each about to release a new line of tractors for the 1959 model year. Deere’s original plans had its new tractors ready to be released alongside those. The wait needed for the New Generation tractors, though, meant that Deere was going to be without a new tractor to compete against the competitors. Marketing decided that Deere had to release a “new” tractor to compete. The New Generation tractors were not ready, of course, and it didn’t make economical sense to do any major reworking of the current tractors. Instead, it was decided to give the 20 series a facelift. The services of Henry Dreyfuss and Associates, the firm responsible for initially styling Deere’s letter series, were used to improve the looks of Deere’s tractors. At the same time, Deere asked the company to improve operator comfort and convenience. Henry Dreyfuss was particularly interested in this area of industrial design anyway, so he was the perfect man to task with the job. Restyling the tractors made it appear as though the company was releasing a new line of machines. Customers, dealers and competitors could all be convinced that what Deere was selling now in 1959 was different from what it sold in 1958, though under the new sheet metal the tractors were mechanically identical. Furthermore, it gave the appearance that Deere was going to continue with two cylinder tractors, a design that it had stood behind since it first got into the business. This bit would play into the surprise across the industry when the New Generation was finally unveiled. A final benefit of the new series was that some of the features planned for the New Generation tractors could be tested on these machines before being rolled out on the truly new machines in a couple of years. Deere originally planned to call this line of tractors the 50 series, but for reasons unknown, that moniker was dropped in favor of the 30 series. Deere introduced the 730 diesel in August of 1958 for the 1959 model year. The tractor was available in three chassis types: row crop, standard and Hi-Crop, and with any of four engines: gasoline, all-fuel, LP-gas or diesel. Of the engines, the diesel was easily the most popular on every chassis. With the diesel engine, the buyer was given the choice of either a starting engine of V-4 design or 24 volt electric starting. The starting engine was proven and reliable but had the drawbacks of requiring a bit more time to start and having a second engine to concern oneself with. On the other hand, the electric starting system was a bit cheaper and allowed a farmer to hop on his tractor and have it started in seconds, but it did not start reliably in cold weather. In the end, more than 60 percent of farmers opted for electric start with the numbers skewed more toward the starting engine as you moved north into cooler climates. Deere made sure that the 730 diesel fit with a wide variety of farmers, their needs and their budgets. Standard equipment on a 730 included manual steering, a plain rear axle housing cover, an adjustable seat with black or yellow cushion, adjustable swinging drawbar, belt pulley, full flow oil filter, two front lights and one combination rear light, platform and a transmission with six forward speeds. Everything else was either optional or an upgrade. Everything. Power steering, rockshaft, remote cylinders and controls, three-point hitch, load and depth control, “live” 540 RPM PTO, Float-Ride seat, deluxe flat top fenders with four front lights, speed-hour meter, electric fuel gauge, cigarette lighter, precleaner, vertical air stack, special transmissions, oil heater and water heater elements, various front axles for row crop tractors, several kinds of wheels and tires (depending upon the tractor chassis type) and more were on the options list. Deere also offered steel front and rear wheel equipment for the 730 diesel row crop and standard tractors. There was not much demand for these anymore, but a few farmers both domestic and foreign still preferred steel wheels on their tractors. Row crop tractors used AF1713R wheels. These wheels bolted to the regular centers. Front wheels were either the AA2345R spoke-type on tricycle tractors or JD1279R for wide front ends. Standard tread steel wheels were the AF1884R for 30 inch centers or AF1885R for 26 inch centers. Front wheels for these tractors were the same JD1279R. Front and rear extension rims and five inch spade or A-shaped lugs for the rear wheels were the buyers’ choices. All of these wheels and options were made by special order only and did not appear on the options sheet. Any of these equipped on a 730 would certainly give some onlookers pause at a tractor show. Another option appeared about halfway through the first production year of the 730 on March 2, 1959. The new ASAE 1000 RPM PTO standard had come into effect and Deere adopted it, releasing the 1000 RPM PTO as an option on the 730. These could be equipped at the factory, as internal conversion kits or as external speed changers to convert the older 540 RPM PTO to 1000 RPM. Farmers stayed about as far away from this change as they could, preferring the older system and fearing that they would have to replace their older equipment. The 730 (and any Deere tractor) would likely have performed better with a 1000 RPM PTO, as its faster speed would have reduced the impact of the slight surging that the uneven power in the two cylinder engine caused. This would have reduced shock to the implement and tractor and would have improved the life of several parts in both machines. Another option also released on March 2, 1959 was for Hi-Crop and standard tractors. These two types of tractor had use for the higher flotation and traction that was available from 18.4-34 rear tires. These tires required a new R21480R wheel casting. To attach this to the Hi-Crop, a new rack-and-pinion stub axle (AR21601R) was made available that would fit the final drive of a 730 Hi-Crop. Only Hi-Crop tractors that had this tire option had these rack-and-pinion final drives. The 730 diesel was not produced in an industrial version, but Deere’s Industrial Division did include all types of the 730 in its catalog. Tractors marketed and sold to industrial firms were mechanically completely identical to those sold to agricultural interests. 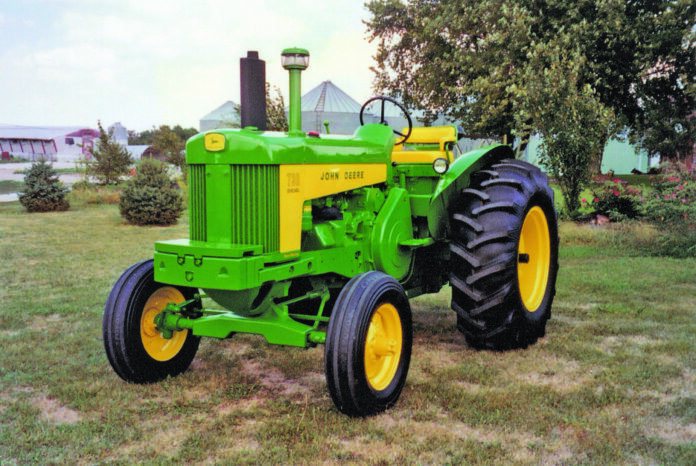 These tractors were made available in industrial yellow, all John Deere yellow or regular green and yellow paint, but other colors could have been chosen at an additional cost. Deere provided a couple of options to help improve the 730’s standing in the industrial market. These were the 18.00-26 road grader tires for the 730 standard and the 1,396 pound AF3910R rear weight package. I suppose the competition smirked a bit when Deere released the “new” 730 diesel in 1959. Many of these companies had already been mocking Deere for 15 years or more for using an antiquated engine in its tractors. The facts stood against them, though, as the 730 diesel inherited the engine from the 720 that had set the record for fuel efficiency when tested at Nebraska. The operator comfort and convenience, hydraulics and power steering on the 730 were far ahead of what the competition had to offer. The optional Float-Ride seat was much more comfortable than any other manufacturer’s, custom Powr-Trol hydraulics were more versatile than any other sort, Deere’s power steering system made other tractors feel like they had chain steer and the “antiquated” two cylinder engine had incredible lugging power and remarkable economy and durability. There are some interesting 730 specimens out there and some of them have brought about some misconceptions. One of these is a number of tractors that look like Hi-Crops with single front wheels. These tractors, however, are not actually 730 Hi-Crops, but they are quite unique. These are 730 drop-axle tractors and only very few are known to exist. These 730 drop-axle tractors were built to work with the No. 22 Hi-Drum cotton picker. This cotton picker was a single row unit. Picking cotton one row at a time means that you have to drive over adjacent rows. If the tractor is not high enough, significant damage to the unpicked plants in the rows not being picked could occur. Therefore, a higher machine was required. Also, tractors equipped with these machines were operated in reverse with a seat and controls mounted above the regular platform. On a typical 730, this would allow for only one reverse gear. More than one pass is typically made through a cotton field when picking and the latter passes are typically done at a higher speed, as there is less cotton to harvest at that time. Having but one speed to choose form would not work well. IHC’s choice to remedy this situation came through the adoption of a “drop axle.” This solved both problems. First, it increased the vertical clearance of the tractor. Also, since the drop box had no idler gear, travel of the machine was reversed. This allowed all of the forward speeds to be used heading backwards, giving the operator full control over how fast he moved through his field. 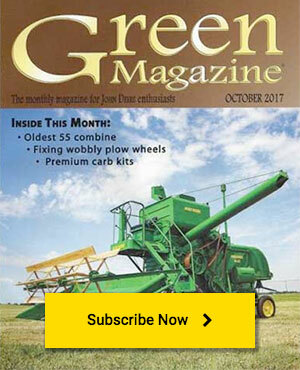 Deere had long been behind in the field of cotton pickers, but it wanted to get into that market now. The chief engineer in charge of cotton picker design believed that a drop-axle design was the best choice and that the 720 and 730 should have one of these designed for them. The Des Moines Works and the Waterloo Tractor Works pulled together and created a drop axle for the 730. Despite the misgivings of some of the engineers under the chief, who believed that the No. 99 self-propelled two row cotton picker would make the No. 22 mounted machine largely worthless, Deere went ahead with the project and a few of these 730 drop-axle tractors were built. The purchase of one of these kits got you a new flanged rear axle housing, two rear axles, two drop-axle housings with gears and sleeves, a 20 inch single front wheel and yoke, two offset wheel castings and a mounting bundle to attach a high-drum No. 22 cotton picker. It was no small task to equip these parts on a 730, so it is likely that dealers did most of the installing. Once installed the first time, though, a farmer could remove the drop-axle units from the flanged axle housings and insert the regular axles, allowing him to use the 730 as a normal row crop tractor, then put it back together as a cotton picker when it came time to pick. Dealers complained about having to change the rear axle housings, though, and farmers complained about the cost of having them do it. On August 16, 1959, Deere made this setup a factory installed option rather than a dealer installed one. Just as it is not known in any other aspect how a 730 was equipped when it came from the factory, it is not known if a 730 left the factory with a drop-axle kit. It is also not known how many of these kits were sold separately. Few of these old kits probably ever existed and even fewer likely live on today, having been buried in the corner of a shed somewhere for years after a cotton farmer purchased a self-propelled picker to replace his old No. 22, then driven off to the scrap yard when the price of iron went high enough. The 730 diesel retained its predecessor’s spot as the top seller of the series and a combined-chassis total of more than 22,000 were built in Waterloo. The rest of the 30 series may have ended production in February of 1960, but the 730 went on for more than a year longer, with the last one rolling out on March 1, 1961. All of the 730 tractors built after June 15, 1960 were sent abroad, however. Even that wasn’t the end of the 730, however. In September of 1957, Deere decided to expand its horizons, quite literally, by building a plant in Rosario, Argentina. The plant was opened in 1959, with the anticipation that it could build as many as 3,000 tractors each year. Most of the components for the 730 tractors built there were shipped in from Waterloo, but some parts were sourced locally. The Argentinian government was happy to have Deere in the country, but before long, it began requiring the company to use more and more “local content” in their tractors. Deere abided, despite the difficulty, and tractors continued to be built there. When Waterloo was finished building 730 tractors, much of the tooling was shipped to Rosario so that the plant could begin producing in earnest. Row crop, standard and Hi-Crop tractors were built in Rosario, but all tractors built there were diesels with electric start and manual steering. Power steering was introduced for these Argentinian 730s in 1968. This system was different from that used on the Waterloo 730s and was more like that used on the 5010. The 730 did very well in Argentina. It was well suited to the conditions and farms in the country and Deere had success selling it there. All things must end, though, and the tooling for the 730 was beginning to wear out, having been in use for more than a decade when production ended in 1970. Over 20,000 of the 730 tractors were built in Rosario. These were the very last tractors of the two cylinder era. Maybe going all the way to Argentina is a bit too far, but you still want a foreign 730. You’re awfully picky, but there’s one more option for you. Deere’s Monterrey, Mexico factory produced six groups of 730 tractors. These tractors were assembled out of kits that were sent from Waterloo. Finish painting was also done in Monterrey. Exact numbers and configurations of these tractors are not available, but it seems that most of them were row crop diesel tractors with electric start. A few standard tractors may have been built there, as well, but none have turned up. Except for tri-lingual gauges and serial number plates, these tractors were identical to those built in Waterloo. It seems that most of these tractors were bare-bones machines with very few options and manual steering, but most, if not all, of the options list was available to them. The 730 diesel was easily the most common Deere tractor of its era, which is nice, because they’re also highly sought after today. Even despite the relative prevalence of them, a 730 diesel row crop fetches a high price. I suppose the smooth lines and never-say-die toughness of the machines makes them so popular. So does, then, the fact that they were the last piece of the two cylinder era, existing (even in the United States) into the New Generation. Of course, there are also the painfully rare 730 Hi-Crops which will bring more than a brand new foreign sports car. Many 730 diesels may now be living out their days pulling nothing heavier than a parade float and only getting dirty from their ride on a trailer to a tractor show on a rainy day. Thousands of others are still in the field, though, being used by specialty or small farmers. After all, it’s still one of the most efficient tractors ever built and the price of diesel isn’t exactly plummeting. No matter what you use it for, though, you can be sure that a 730 will maintain its value and look good doing it.